Tony Nicconi has kept an unbeaten record in winning the Vain Stakes at Caulfield. 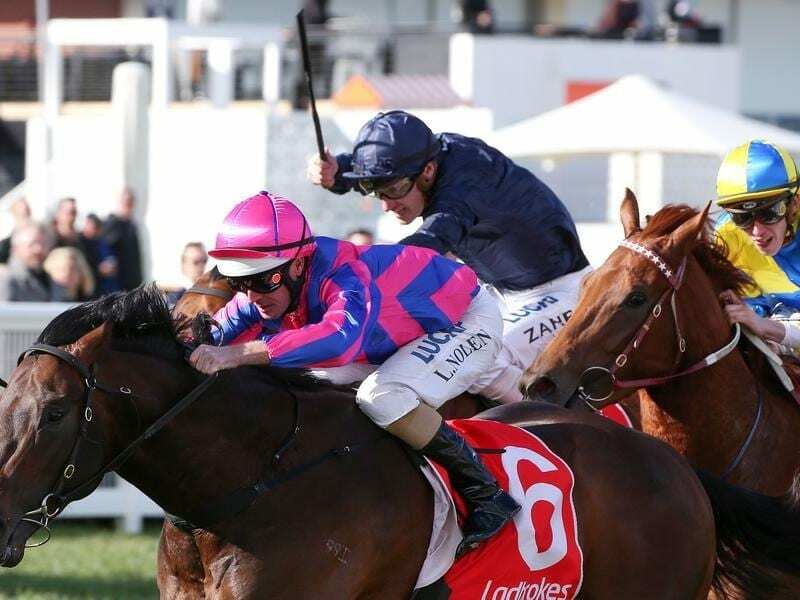 Lindsay Park looks set for a successful season with its three-year-olds after providing a one-two finish in the Vain Stakes at Caulfield. Saturday’s Group Three race was the first stakes race of the new racing season for three-year-olds with Tony Nicconi leading home stablemate Long Leaf. Ridden by Luke Nolen, Tony Nicconi was sent off the $2.30 favourite in defeating Long Leaf ($6) by a long neck with Native Soldier ($13) a half length away third. Co-trainer David Hayes said the pair would take different spring paths with Tony Nicconi kept to sprinting with Long Leaf stepping out in trip. He said Tony Nicconi was likely to return to Caulfield in two weeks for the McNeill Stakes before tackling the Danehill Stakes on September 15 and the Group One Coolmore Stud Stakes on November 3. Hayes said there was improvement to come from the pair. “Tony Nicconi did all the hard work into the wind while Long Leaf had the weight penalty,” Hayes said. “Tony only went into it off one trial so there’s a lot left for him for the spring and Long Leaf, first-up, running short of his distance, put his hand up for the Golden Rose. “I thought it was a terrific effort. Aylmerton was trained by Jean Dubois before transferring to Lindsay Park after Coolmore Stud, who also own Long Leaf, bought into the colt.